Geologists take great pains to measure and record geological structures because they are critically important to understanding the geological history of a region. 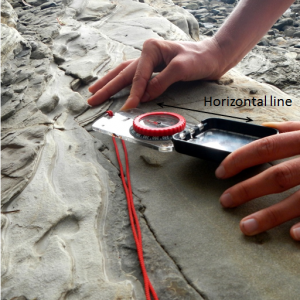 One of the key features to measure is the orientation, or attitude, of bedding. We know that sedimentary beds are deposited in horizontal layers, so if the layers are no longer horizontal, then we can infer that they have been affected by tectonic forces and have become either tilted, or folded. We can express the orientation of a bed (or any other planar feature) with two values: first, the compass orientation of a horizontal line on the surface—the strike—and second, the angle at which the surface dips from the horizontal, (perpendicular to the strike)—the dip (Figure 12.18). 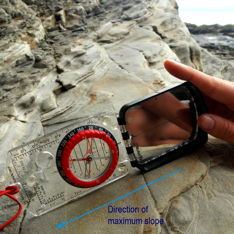 Measurement of geological features is done with a special compass that has a built-in clinometer, which is a device for measuring vertical angles. An example of how this is done is shown on Figure 12.19. 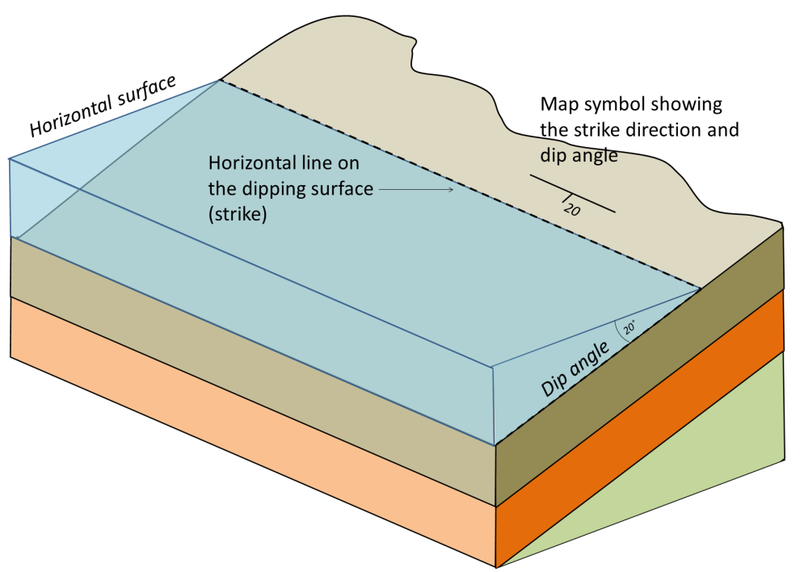 Strike and dip are also used to describe any other planar features, including joints, faults, dykes, sills, and even the foliation planes in metamorphic rocks. 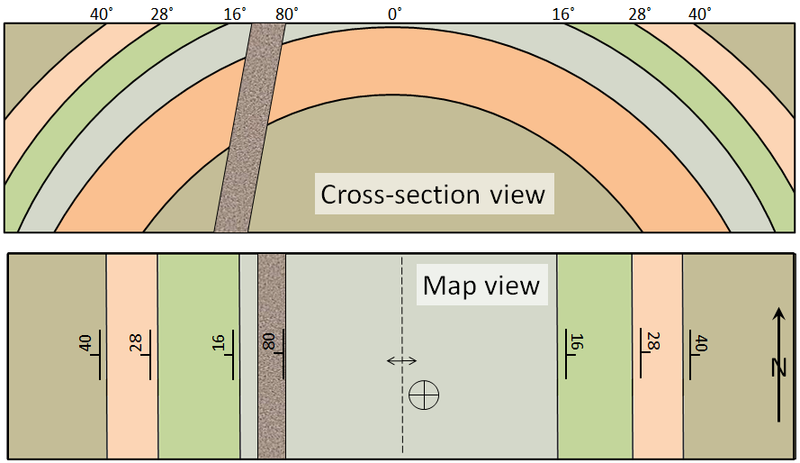 Figure 12.20 shows an example of how we would depict the beds that make up an anticline on a map. The beds on the west (left) side of the map are dipping at various angles to the west. The beds on the east side are dipping to the east. The middle bed (light grey) is horizontal; this is denoted by a cross within a circle. The dyke is dipping at 80˚ to the west. The hinge of the fold is denoted with a dashed line with two arrows point away from it. If it were a syncline, the arrows would point towards the line. 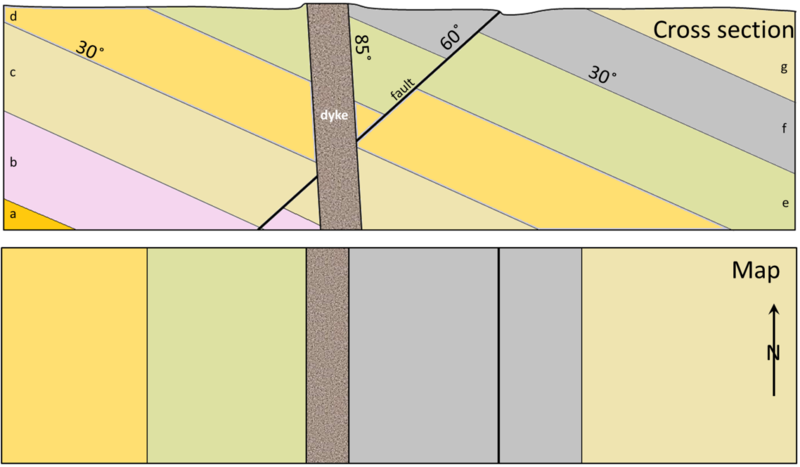 This cross-section shows seven tilted sedimentary layers (a to g), a fault, and a steeply dipping dyke. Place strike and dip symbols on the map to indicate the orientations of the beds shown, the fault, and the dyke. Then answer the questions. 1. What type of fault is this, and is this an extensional or compressional situation? 2. What are the relative ages of the nine geological features shown here (seven beds, dyke, and fault)? 12.4 Measuring Geological Structures by Steven Earle is licensed under a Creative Commons Attribution 4.0 International License, except where otherwise noted.